Remember kettles sweating in kitchens of unholy steam? And listening for the lids to pop on all those Ball jars ladled full of tomatoes, pickles, peppers or jelly? If I could award this poem by Nancy Pulley a blue ribbon at some state fair of poetry, I would. It gets at the mystery of the canning pot, after all, where clusters of grapes, assisted by pectin, sugar and heat, get transmuted into wine-colored gel. At heart, this is a love poem for Pulley’s mother who presides over the sacrament, her palms stained “like no crayon, like no paint.” A “widow waiting for the next veteran’s check,” she nonetheless treats her daughters to a purple bounty. And poetry has brought her back. dripped bright purple into a waiting pan. 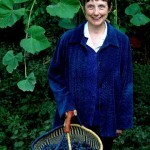 the grapes, into her very blood. Nancy Pulley lives and writes in Ogilville, Indiana. Her poems have appeared in Tipton Poetry Journal, Indiannual, Flying Island, Arts Indiana Literary Supplement, Passages North, Plainsong, and Sycamore Review. She’s the author of the chapbook, Tremolo of Light, published by the Writers’ Center of Indianapolis.